OSWEGO, NY – Car owner Steve Miller began his supermodified career in 1971. Over the years he has fielded many cars with many drivers aboard his car, nicknamed the Sweet Sixteen, which has been a familiar site at Oswego, all over the northeast and in Canada. But there was one place the team hadn’t visited over the five decades and that was victory lane. Last July at Oswego Speedway as a part of ISMA’s King of Wings IV, that all changed. When Miller’s driver, Texan Paul White, couldn’t make the trip, Steve called Dave Gruel, whose non-winged number 50 was not running with a wing, and asked him to drive the uniquely designed blue 16. The rest is history. Gruel jumped aboard, drove the car to a heat win and picked the second starting spot for the 50-lapper. Gruel said later that he had one plan. To get out front and go hard. Fifty laps later, Steve Miller had his first career win as a car owner and Gruel, his first ISMA feature win. He definitely deserved the King of Wings title this night. 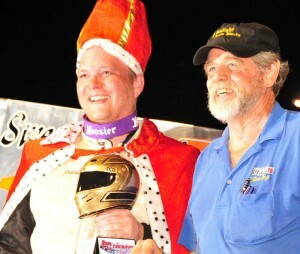 Standing in victory lane with his King of Wings apparel, Gruel was more than elated. “Unbelievable. I just can’t believe this. It’s awesome. For Steve Miller and the whole team who have been racing all this time, to get their first win with them in the first time in the car. And to win with an awesome Kevin Enders motor in it – that combination made the car just unbelievable. I think I led the whole thing. I said I’m just going to stick it out there and do whatever I can to get out front on the first lap. Then I figured I’d push it on every single lap as hard as I could. I didn’t have any idea how far out I was. I had a scary deal up there when I think McKnight was trying to get his lap back. Luckily we had tires at the end of the race. Today was my first time in the car. Steve’s driver wasn’t able to make it. I’m sure he won’t be too happy. I just want to say thanks to everyone who helped make this happen,” he said. Moving into second through some heavy traffic and some attrition up front was Johnny Benson Jr. in the PATCO 74. He might have liked to move up one more spot, but considering the circumstances, he was happy in second. Charlie Schultz, the 2009 King of Wings winner, was pleased with a podium finish as his luck had dropped off at Oswego after that win. “It would have been nice to get a repeat. Dave and I talked this week about the last six times we’ve been coming up here and we pretty much stunk. It’s been bad from drop of the green We made some wholesale changes on the car for this race. We unloaded and it was pretty fast. I got third fast. To come out with a top three and be back on the podium is great. Thanks to whole team and Dave and Lori May for standing by me. And, thanks to the fans for coming out,” he said. As was his goal, Gruel powered to the lead at the drop of the green, pulling quickly away from Lilje and the pack. By lap 16 the Sweet Sixteen was nipping at the back of the field as Lilje, Randy Ritskes, Lou Cicconi, Jeff Locke, Charlie Schultz, Timmy Jedrzejek and more were racing for position behind. By the midway mark, with no yellows flying, it was evident that Benson was the man on the move, now up to fifth behind Jeff Locke who held fourth with Gruel, Lilje, and Ritskes still the top three. Mayhem broke out just into lap 29 when four cars jammed up in the second turn taking out Lilje, Joe Gosek in the May 77, Jeff Holbrook and Dave McKnight. Lilje, the second place runner at the time described the incident. “We went into the corner and there were a few lappers and the leader dicing it up pretty good. I don’t know what happened to start it but two or three cars got sideways and I didn’t have anywhere to go. I caught a wheel and got her into the fence,” he said. The order on the restart changed to Gruel out front with two lap cars separating him from Locke, Benson, Schultz and Lou Cicconi in the top five. A quick yellow ensued which found Jason Spaulding into the pits and returning at the tail. When the green stuck, nothing was going to mar Gruel’s plan to stay out font as his car owner Miller paced a groove of his own in the pit asphalt watching. With less than ten laps to go, both driver and car owner had to suffer through one more yellow, which took second place runner Jeff Locke out of the picture. Locke said later he just got in too deep in two with his 37 pushed to the pits for a 13th place instead of a possible second. Back under way for the last time, Gruel just walked away from Johnny Benson and Charlie Schultz as Lou Cicconi and Timmy Jedrzejek moved up into top five spots. The cheer from the crowd was thunderous as Gruel crossed under the checkers all alone, with Benson, Schultz, Cicconi and Timmy J a distance behind. Mark Sammut, Ben Seitz, and Bobby Bond were the last cars in the lead lap in sixth through eight. Sprint car driver Sondi Eden finished ninth in her first ever super ride at Oswego and Bob Dawson was tenth. Oswego Speedway’s ‘Best of 2012’ will continue each week leading up to opening day on May 4 with the return of the mighty ISMA Supermodifieds.